Have a kindle? Is 1 weeks continuous battery life not enough? Do you want a fancy case with a built in LED light? 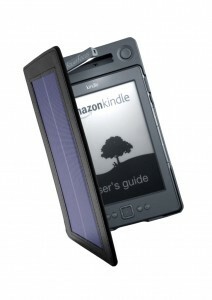 Then you probably want one of these, a company called SolarMio has a solar-powered Kindle case with an 800 lux LED light. Pop the light out and it turns on, pop it back in and it’s off. here’s a 1,250mAh battery that can provide up to 50 hours of illumination when fully charged, and better yet, can also be used as backup power for your Kindle. It’s not clear how long charging takes but the company states that one hour of sunlight can give you three days of reading. Sounds pretty good eh? It’s made from pleather and costs $80. Shipping will start January 14th.